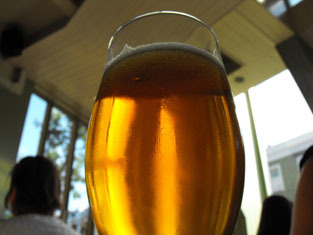 The American-style IPA market is a heavily saturated one. There are lots of really good beers to be found in this category, but it really takes something to stand out – I can think of 3 or 4 beers that do. One of them is Odell IPA, particularly when it's available on keg. After admiring its vibrant orange appearance, you’re rewarded with an incredible concoction of fresh mango, lychee, pineapple and passion fruit aromas as soon as you get anywhere near it. The citrusy, orange bitterness is huge and upfront on first taste, but mellows as your palate adjusts. Alongside a smooth, subtle, cream soda-sweetness, those tropical punch aromas are mirrored in the heady, refreshing mix of flavours. I get beer blindness whenever I see it on a beer list. I go for it time and time again because I know it will be brilliant. Doug Odell started homebrewing before I was born. He started Odell Brewing Co in 1989, before I even really knew what beer was. 90 Shilling, his brewery’s flagship beer, is in my top ten – possibly top five – beers of all time. He undoubtedly knows what’s up. I’m at CASK’s first US Meet the Brewer event, featuring Doug Odell. As soon as I get there I go for a half of Odell IPA. I should have just got a pint. There’s little point in drinking anything else when this beer is around. Doug gets up to talk. He keeps it brief, simply thanking the staff at CASK and describing beers as free samples come round, including selections from the oak-aged Woodcut series. His measured brevity suggests a man who is experienced at dealing with a room full of people who have been drinking beer. Before I leave, I make a point of saying hello. I attempt not to come across as a fawning fanboy. I’m not sure I’m successful. We talk briefly and he clues me in to something exciting about one of my favourite beers. As I make my journey home, any elation I feel is unexpectedly replaced by paranoia and doubt. Who am I to write about beer? Who am I to judge whether one beer is better than another in the face of such talent? I know the basics of what goes into making beer, yes, but when I’m party to brewer-to-brewer conversations, I feel like brewing is akin to alchemy, quantum physics...structural engineering even – an arcane mix of science and sorcery that I will never truly understand. However, I cling to the hope that it’s my acknowledgement of my own inadequacies that allows me to appreciate great beer like Odell IPA in the way that I do. Another cracking post, Chris. I love this beer. Is there a better US IPA available in the UK? I don't think so. Great writing. Honest, accessible and easy to read. Odells IPA is brilliant. I totally agree with the 'beer blindness' comment. 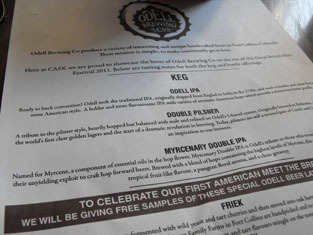 Odell have this craft beer scene nailed in taste, tradition and looks. Mark – thanks! I would love for there to be a better US IPA in the UK, cos that beer would be utterly incredible!